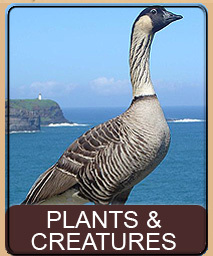 Habitat: Dry tropical, sealevel to 3000 ft. 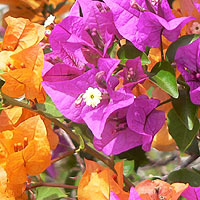 The beautiful Bougainvillea is one of my favorite plants in Hawai'i. Each plant is extremely vibrantly colored, ranging from the brightest of purples, through reds, oranges, peppermints, yellows and whites. Grown primarily for ornament use due to the overwhelming saturation of color, these vines can be found throughout the Big Island. Quick! 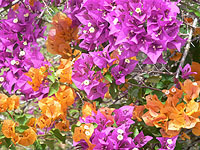 What color are the flowers of the Bougainvilleas? If you just said reds, oranges, yellows, etc... Wrong. The flower of all Bougainvilleas is white. 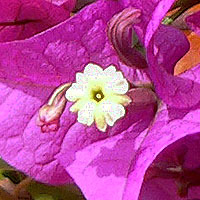 You have to look closely to see a Bougainvillea flower, as it is hidden in the center of the bracts. 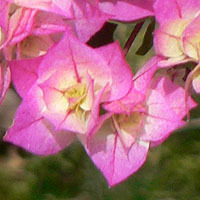 Bracts are modified leaves and it is the bracts that are so brightly colored on a Bougainvillea. 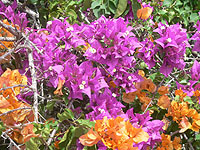 The Bougainvillea is a vine that can grow if unchecked to over 22 feet in length. 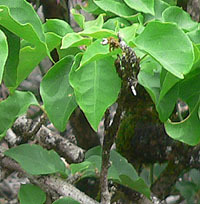 The vine has small thorns and bright green leaves as well as the modified leaves (bracts) that are brightly colored. 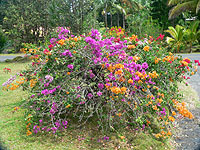 If it isn't cut back, a Bougainvillea will climb any tree or wall to any height. 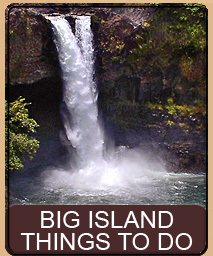 You can often see huge trees on the Big Island that have a Bougainvillea growing up to their top. The result is a spectacular waterfall of color from the top of the tree to the base. 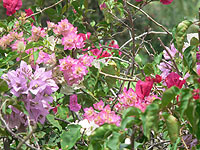 The pictures here are all of Bougainvilleas that are growing on my property. 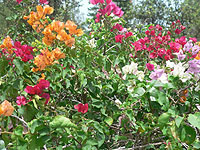 The plant in the front yard has 5 different Bougainvillea vines, each a different color, growing intertwined together. We keep our Bougainvilleas cut way back so they grow as a controlled bush. While Bougainvilleas generally prefer the dryer weather of Ka'ū and Kona side, where they grow more full and luscious, they still do very well on our wetter Hilo side. 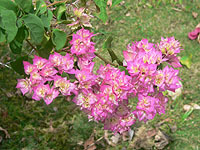 Louis de Bougainville, a French Navigator, first discovered the Bougainvillea in Brazil. Apparently nobody had noticed the vibrant plant before, go figure. Anyway, that discovery netted Louis the prize of having the plant named after him, as well as probably being one of the most mispronounced plants out there. 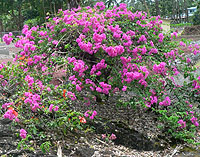 The Bougainvillea eventually found its way to Hawai'i when Father Alexis John Augustine Bachelot brought the plant with him when he arrived off the coast of Honolulu around July of 1827. At first, Father Bachelot and his companions were denied residence in Hawai'i. While the matter was under dispute, however, the missionaries landed and rented space and began preaching. This did not go over well with the other missionaries on the island, primarily Protestant, who saw the arrival of the Catholics as an invasion onto their turf. The Protestants, having an ear with the Queen convinced her to order the captain of another docked ship to take the Catholics as passengers, but the captain refused and left without them. It would take over 3 years before another opportunity to oust the Catholic missionaries would appear and they were forcibly placed on the Waverly (a brig) on the 24th of December in 1831. 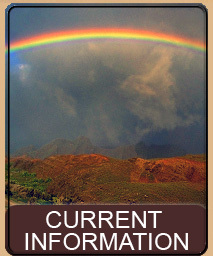 The good Father made another shot at Hawai'i when he landed in Honolulu on April 17, 1837. 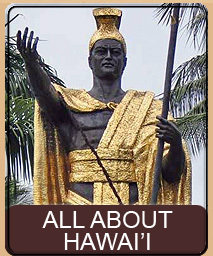 King Kekuanaoa gave them permission to remain but on the 29th of April he ordered the missionaries to again leave. Father Bachelot waited for months for a schooner that was announced to arrive, but in the meantime another priest from the same Catholic group attempted to land. At this point the situation became intolerable and Father Bachelot purchased a small schooner and left Hawai'i with the new priest on the 23rd of November. 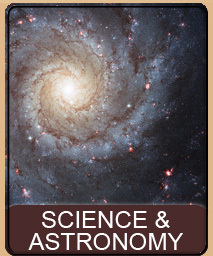 However, Father Bachelot was ill when they set sail and soon after died at sea. 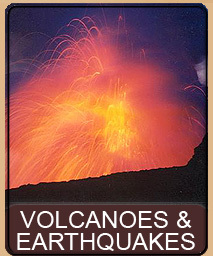 Besides bringing the beautiful Bougainvillea to Hawai'i, Father Bachelot also left behind a number of works in Hawaiian grammar and early dictionaries as well as a prayer book in native Hawaiian. A close up of the unmodified leaves. Intertwined plants exhibit a range of colors. This page is named 'Plants.bville'. Can't Find It?